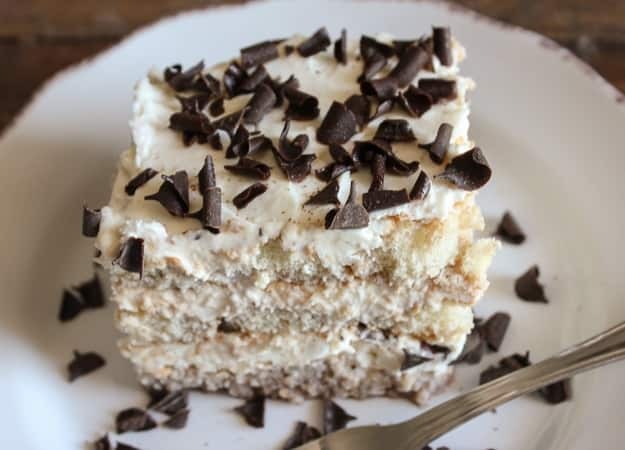 This Easy Tiramisu Recipe for Kids is simple easy and so delicious. Made with an ingredient that kids and adults will love. 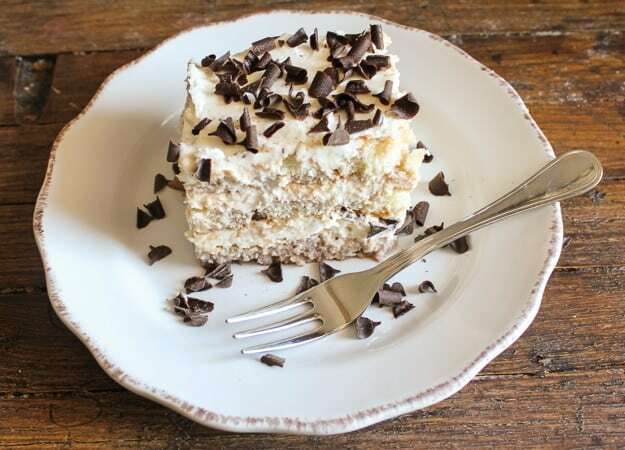 Creamy and so yummy this is the perfect Easy Kid Friendly Tiramisu. My questions are, can you really eat too much Tiramisu? How many variations of Tiramisu are there out there? Well, no and a lot. I have made a few myself, from Easy Tiramisu to Strawberry tiramisu. There is probably a Tiramisu Recipe for everyone. Including this Easy Tiramisu Recipe for kids. Tiramisu which in English is translated to mean Pick me up. A reference to the espresso coffee which is used in the original Tiramisu Recipe. Personally I think this dessert is so amazing anyway it is created that it is a pick-me-up with or without the espresso! The first time I tried this was a birthday party for my nephew. My sister-in-law made the classic Tiramisu and another very delicate Tiramisu made with what I think is almost every kid’s favorite, chocolate milk. 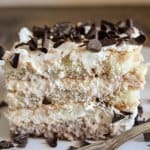 I make this Easy Tiramisu Recipe for kids even a little more kid friendly by not adding any eggs. Just some creamy mascarpone and whole cream. It’s even better when you make it a three-layer-dessert. Instead of dunking the Lady Fingers in strong coffee I dunk them in chocolate milk. You can either make your own chocolate milk or purchase it pre-made. 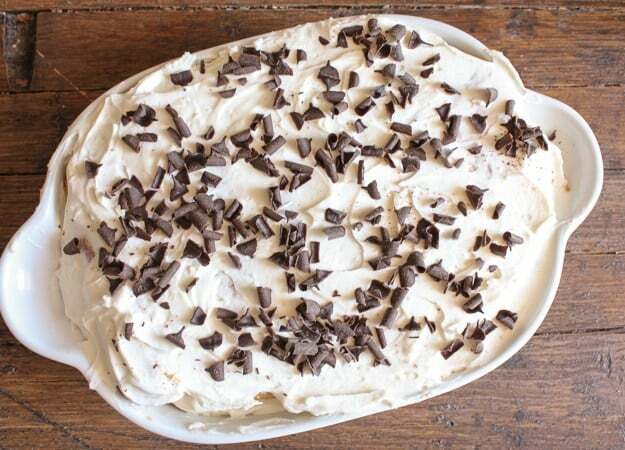 Whip the cream and the mascarpone together until thickened, spread it on top of the lady finger base, sprinkle with chocolate flakes and continue with another two layers and of course don’t forget the chocolate flakes. In my opinion one of the best if not the best no-bake desserts. Make it in the morning or the night before and refrigerate until the next day. Perfection. 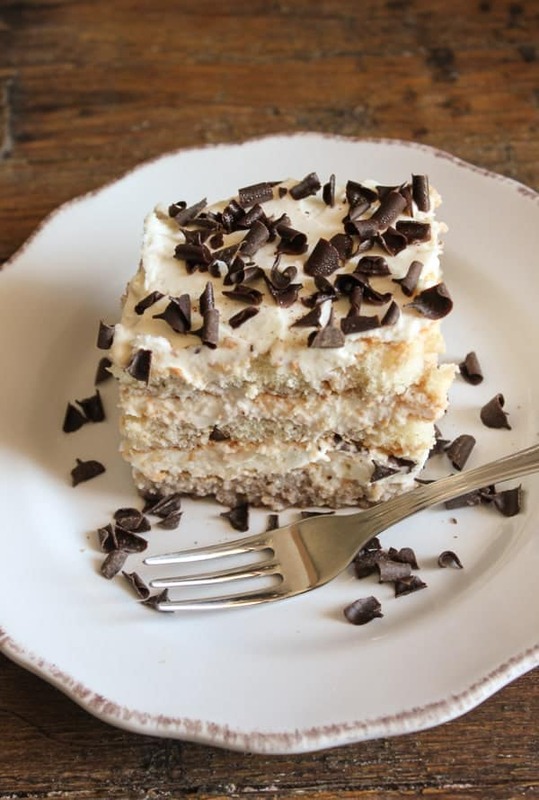 Never mind the kids this Easy Tiramisu recipe, just might become everyone’s favorite. Enjoy! The perfect Tiramisu Recipe for kids, no coffee or eggs. In a medium bowl add mascarpone, whipping cream and sugar. Whip until thick. In a medium bowl add chocolate milk, dunk Lady Fingers one at a time and add in a single layer in baking dish 7 1/2 x 6 x 2 1/4 inches (20 x 15 x 6 centimeters), 7 cookies to each layer. Spread with 1/3 of the cream mixture, sprinkle with chocolate flakes and continue with remaining 2 layers. Sprinkle top layer with chocolate flakes just before serving. Refrigerate at least 3-4 hours or better still over-night. Enjoy! Is there any other kind of cookie that could be substituted, we live in a small place with limited cookie selection. Hi Jorian, to substitute the lady fingers you could actually use cut up sponge cake, that works really well. If you can’t get sponge cake then you can make your own. 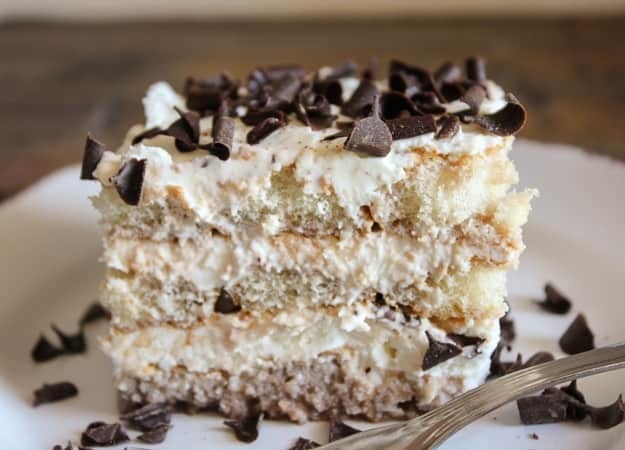 (very easy you can use the cake recipe from this link https://anitalianinmykitchen.com/tiramisu-layer-cake/). Hope that helps. Hi, is the whipping cream, cool whip. or is the stuff that comes in a milk container. Hi Lisa, yes you can use whipping cream or whole cream. Hope that helps. Did you use the soft sponge cake ladyfingers or the firmer cookie type? Hi Susan, I usually use the firmer cookie type, I have never seen the soft sponge cake ladyfingers here, sounds interesting. I think either is good, whichever you prefer. Let me know how it goes. Have a wonderful Sunday. Hi Kathy, sorry about that, it should be whipped with the cream and mascarpone. I think even if it is missed it would still taste really good, it’s really not that much sugar to make that a difference. Hope that helps. Thanks. hi, do you have any suggestions on how to get this to fit a 13×9 tray? Hi Rachel, sorry for the late reply (for some reason your comment went to spam) anyway I would probably double the recipe, and then if necessary break the cookies to fit the pan. Have a great day. Not sure I am happy or sad you made this kid friendly. It is my favorite dessert and I use to say hands off–you aren’t allowed any 🙂 But my hips thank you! Hi Kristen, you could always make 2! One for you and one for them. Have a great day. Excellent idea!! I made this with decaf — the kids loved it. But I think the chocolate milk will give it a rich taste. Another great recipe — thank you for sharing. Hi Marisa, thanks very much, chocolate milk is a nice change and the taste is delicious. This recipe looks amazing. I think my granddaughter would enjoy making this with me. Hi Ann, thanks very much I hope you and your granddaughter enjoy it!